This is one of our most enjoyable classes as we love to share our passion for quilting! In this class you will learn many techniques from Diane including: selecting your fabrics, cutting them precisely and pressing them the correct way; getting an accurate ¼” seam with either a ¼” foot or a walking foot; and quilting and binding your quilt. 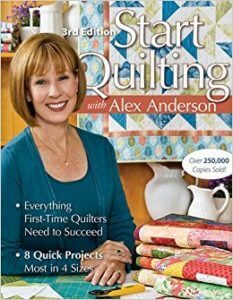 We will use the book “Start Quilting with Alex Anderson” which is included in the price of the class, to create the quilt pictured. You may also use one of our BERNINA sewing machines if you do not have a machine. The class is 5 sessions long. Cost is $100 and includes the required book. Fabric is extra and must be selected prior to first class. Minimum 3 students.